You’re One Strategy, One Tip Away From the thing YOU Need to Be Free of Binging Forever! • Group Coaching Calls – these bulimia support calls will provide you with a community of women just like you who overcoming bulimia, too. • Power Packed Updates – receive my newsletter of helpful tips, tools and inspiration to keep you on your path to beat bulimia. 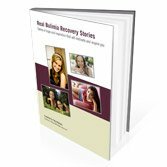 • A Recovery Community – share your story, read bulimia recovery stories from other women, and learn valuable lessons from others in the community on my bulimia recovery blog. Sign up today and receive my inspirational Bulimia Recovery Stories Book as my gift to you. This book is filled with the inspirational stories of women who have successfully recovered from bulimia. Learn how they did it and discover ideas to help you get started today.